Sash windows can be a bit of a problem to maintain but well worth the effort as in my opinion they look so much nicer than modern windows, especially on older properties. A common problem is that they are difficult to open. This is usually caused by having been painted badly so the paint has sealed them shut. Over many years this can build up. So how do you unstick a window that has been painted shut? Firstly look closely down the lines where the window runs in the frame runners. Does it look like they are sealed with paint. You'll need to look on the outside as well. With a sharp Stanley knife carefully score down the edge. NB don't go at it with a hammer and chisel on the sides as this will ruin the wood. A chisel is too thick here. Sometimes the paint has penetrated quite a way and it's difficult to get a Stanley knife in deep enough without damaging the paintwork. 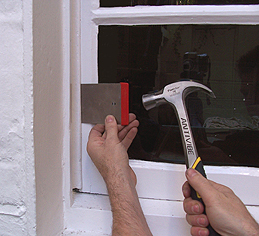 If the Stanley knife does not free up the window I next use a flexible steel scraper. I highly recommend these scrapers because they have several uses (I also use them for applying filler and several other jobs) are ideal for this. Buy them at any good DIY or decorators store, they come in packs of various sizes and are really cheap. They are made from very tough springy steel, but are very thin indeed. I find they are great to force into the gaps. Use a medium sized one(3-4 inch). 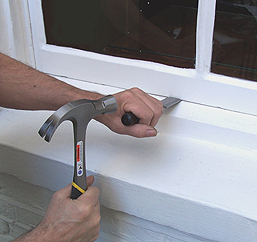 Hold it up to the gap and gently tap with a hammer. Because they are so thin they can get into the gap and free up the window without any damage. Do this all around the joins in side an out. You might feel the window give a little when it's free. Most times I find the above works .You should be able to open the window now. If not a final thing to try having firstly done all the above is to use a hammer and chisel. For the lower window place the chisel only from the outside at the base. For the upper window place the chisel only from the inside at the top. Gently tap a little at each side. This should free it up. Don't hammer too hard or you may damage the wood work. Use as wide a chisel as you've got to reduce any damage to the wood. can't open sash window, sash window painted shut. 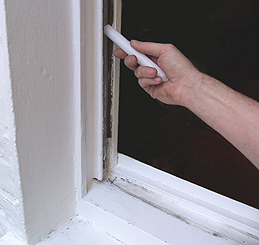 Once you've got the window open use a sharp chisel or sandpaper to remove any build up of paint on the inside of the runners where the windows run on. It can be quite thick there but with a little effort the window should start to run much more smoothly. Tip Finally, I like to use an old candle to apply some candle wax to the runners which really helps the window to run smoothly. Rub the candle hard on all the parts where the window runs up and down the frame. 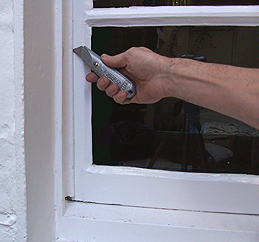 For more information on sash window repairs try sash window experts at www.sashrepairs.co.uk/sash_window_repairs.